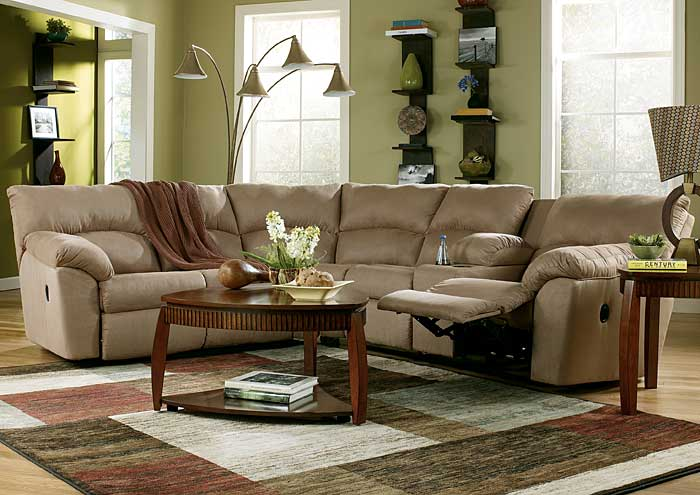 The warm inviting contemporary style of the "Amazon-Mocha" sectional upholstery collection uses soft upholstery fabric over a plush comfortable design to create an exceptional addition to any living area. The plush comfort of the pillow top arms and bustle back design works perfectly with the durable reclining mechanisms to make this sectional the ultimate in comfortable living room furniture. With the compact sectional design featuring a handy storage console this furniture fits flawlessly into the decor of any living room. Create the perfect relaxing atmosphere with the style and function of the "Amazon-Mocha" sectional upholstery collection.